Safe and useful baby bath pillow. Bathing your baby will be easier, and you will enjoy this experience knowing that your baby is secure and comfortable. This pillow keeps your baby warm. When you are a new mother or father, your life becomes a swamp of questions about how you should do different things, and you ask yourself if you are acting correctly or not. One of the greatest fears of parents is to bath their baby, a moment that is not always as pleasant happy and comfortable as we dream before our baby is born. How am I going to hold my baby and bath him/her at the same time? How am I going to clean his/her little head and avoid water from entering his/her ears if I am using my hands to hold him/her? And what if my baby slips between my hands due to the soap? What if he/she swallows some water? How can I take him/her out of the water, hold his/her head and use the towel to dry him/her at the same time if I am alone? In addition, I must be fast to keep my baby warm. All your problems, doubts and insecurities are over with this wonderful invention by Baby Pil. It was conceived by a mother who had all these doubts, and many more. An excited and enterprising mother who, after two years of research, created this renowned brand with such a unique, special and useful product for us and our babies. The baby bath pillows by Baby Pil make our baby’s bath a happy, special daily moment. With their shapes of little animals, they are fun and available in different colours. They are very soft, so your baby will be pleased to use them. In addition, thanks to its bead stuffing it absorbs warm water and keeps your baby warm during the whole bath. Its materials are totally hypoallergenic, non-toxic and anti-mite, so it is a safe product for every baby. Really worthy. From now on, you will enjoy this moment with your baby. You will not need to take care of the size of the tube, since the pillow adapts itself to any size. The bath pillow will hold your baby, so you will be able to bath him/her without fear, massage him/her and play with him/her. Your baby will be warm in the water, so you will not be afraid about he/she being cold. 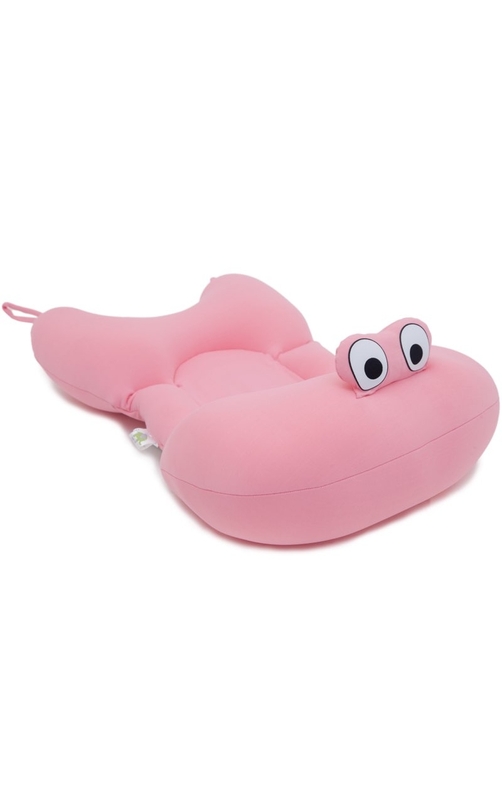 There is no risk of your baby slipping between your hands at all, he/she will be safe, laying on this soft bath pillow. And you will not have to take care of his/her little head, because it will be outside the water and held by the pillow. Additionally, taking your baby out of the water will be really easy. 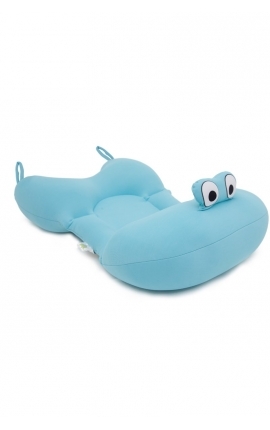 Different from any float you may know, the baby bath pillows by Baby Pil safely keep your baby in the water, giving him/her and you the greatest levels of comfort. Easy to handle, after its use you only have to let it dry. It dries very quickly, the next day it will be ready to bath your baby again. Anyway, you can use it even if it is not completely dry. Get your own baby bath pillow and enjoy every second with your baby. The bath pillows by Baby Pil are a safe, useful and comfortable way for your baby’s bath. You just have to put it in the water and place your baby with his/her little head right under the “eyes”of the pillow. He/she will comfortably lie with his/her head over the water level, without risks. The pillow calms your baby, due to its anatomical shape, its softness and the absorption of the pleasant temperature of the water. Special, one-of-a-kind product that provides relax to moms and dads, freeing their hands to caress and play with their baby, and relaxing their backs because they do not have to hang for almost anything. With the baby bath pillows by Baby Pill, your baby’s bath is all fun! 1 - Fill the tube. 2 - Put the pillow into the water. 3 - Place your baby with his/her head right under the “eyes” of the pillow. The pillow absorbs and mantains the temperature of the water, keeping your baby warm. After you use it, rinse it with warm water and let it dry. The pillow adapts itself to any size of tube. Never let your baby alone, without adult care! The package contains: 1 bath pillow + 1 PVC package with handles and zip + 1 explaining folder + 1 user instructions tag. La hora del baño es gracias a esta almohada aún más especial. Mi bebe está feliz y ya no llora con el agua. Very happy with the purchase, it was worth it. It is very comfortable for the baby and for the parents.